The mast consists of 2 lengths of water pipe pieces 6 m long and 160 mm in diameter. It is held up by two guide ropes and rooted in a concrete foundation in the earth. The mast can simply be laid down by means of winch in order to be able to perform maintenance in safety. This was a rebuild of a 16-poligen engine into a dynamo synchronous generator by the Initiative group CreaProtect. It achieves approximately 2.7 kW (with 400V over 4 kW) with 250 V. mass: 53 kg 400 V rotary current between 340 r.p.m. with virtually no friction. 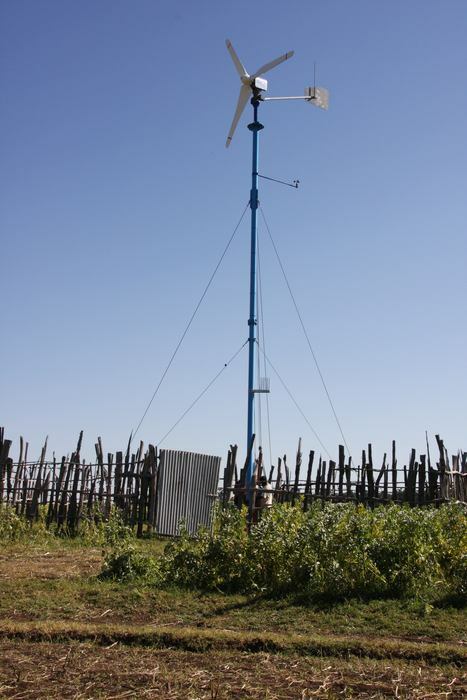 The generator sits on a backward tipping and revolving head, that was developed by the company "Wind Technology Heyde“. In a storm, the head goes in to a so-called helicopter position. The wind direction is determined by means of Wind flag. Washers have been left out that the technicians can untwist the cable regularly. The sliding variation of the head has the advantage that by lightning strike a direct earth current is available. A three bladed rotor with a diameter of 4 m is used. This was developed by the company „Wind Technology Hedye“(Dippoldiswalde) and laminated by the company "plastic processing Dr. Vogel “(Lampertswalde near Großenhain). The blades are relatively broad,(speed size approximately 6), and guarantees high performances with little noise. (Starting already with 3 m/hr winds). The rotor sits directly on the generator wave (gearless). The rotary current is rectified in the small Transformer station and is sent in two parallel controlled simple light current inverters, that passes the direct current to the accumulators, (10x 150 ah, on 24 V encased), this process beginning already with 130 V rotary currents. The main power lines were laid in the earth in Debo.